The Freccia dell’Elba (the ‘Elba Arrow’) leaves the Stazione di Santa Maria Novella in Florence every morning at 0535. 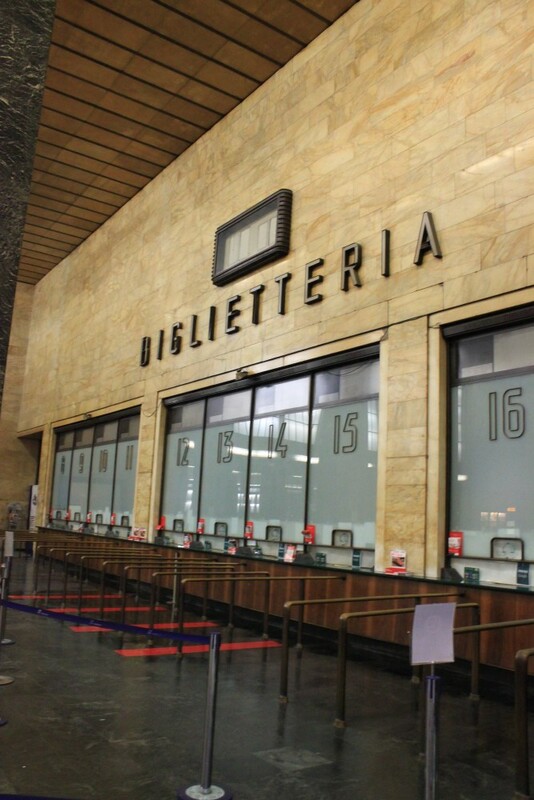 The departure point is a railway masterpiece that ranks highly even amongst the many other fascist-era Italian stations and one could spend many hours just staring around in wonderment. We have arrived at this early hour to be whisked to Piombino, from where ferries can be caught to the island of Elba. 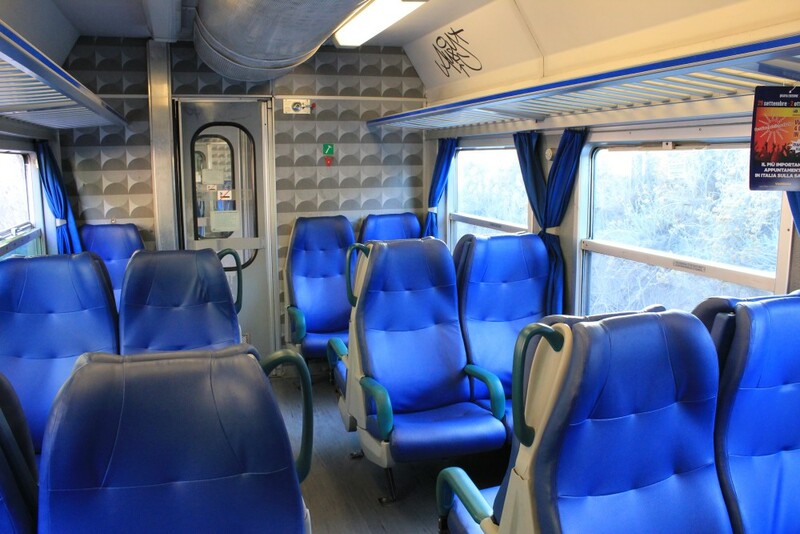 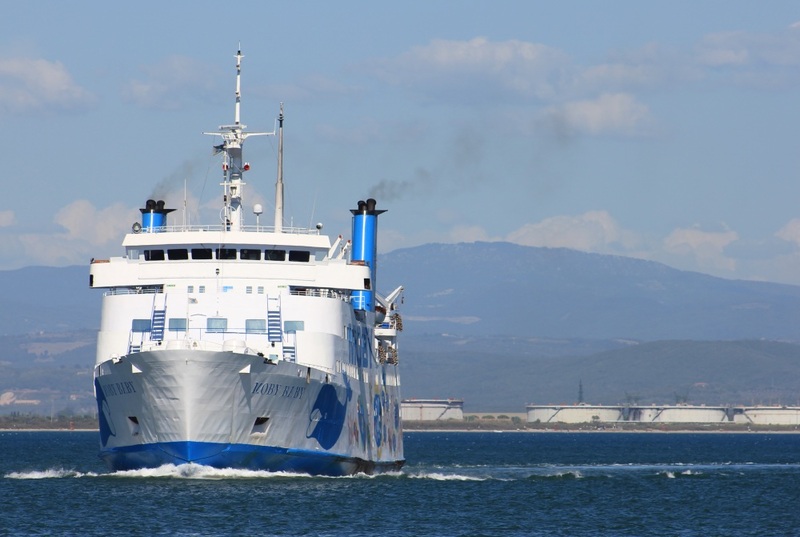 The Freccia dell’Elba is the one daily train which provides a direct service from here to the port station, avoiding the need to change at least once, usually at the little station of Campiglia on the Pisa-Livorno-Rome main line, a couple of hours into the journey. 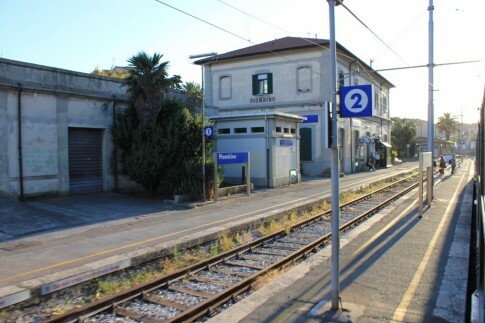 It is at Campiglia that the branch line to Piombino diverges, at first meandering through fields, then sailing through the tiny station which serves the site of the all-but-abandoned Etruscan city of Populonia. Suddenly, this calming vista is interrupted, like a scene from the end times, and the train is surrounded by aged and abandoned heavy industry. 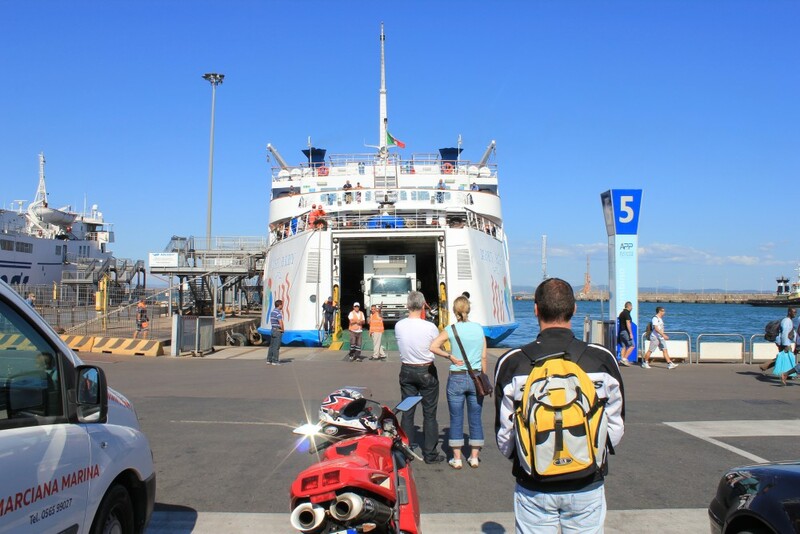 These are the industrial ruins of Piombino’s troubled metal industry which, where it survives, continues to belch smoke and dirt and provides a dramatic backdrop to the ferry port. 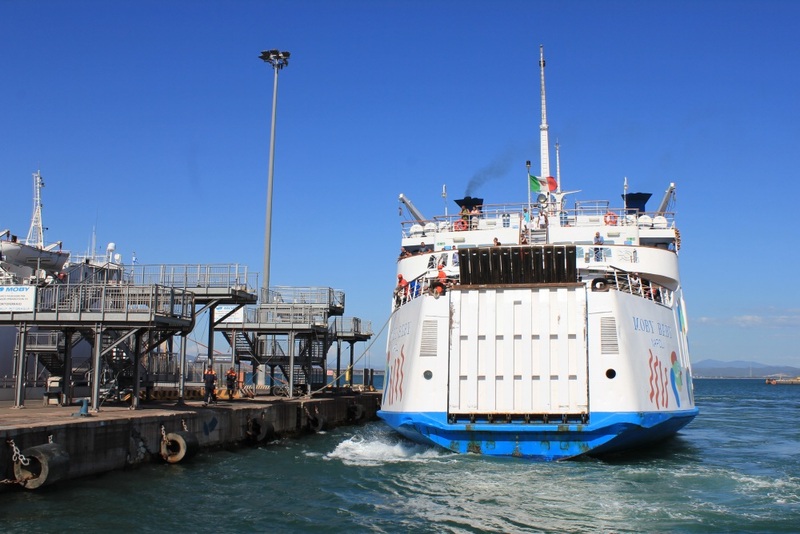 Soon, we are at Piombino station which appears to be a terminus and, as the conductor, driver and most of the remaining passengers disembark, it is easy to be fooled into thinking this really is the end of the line. 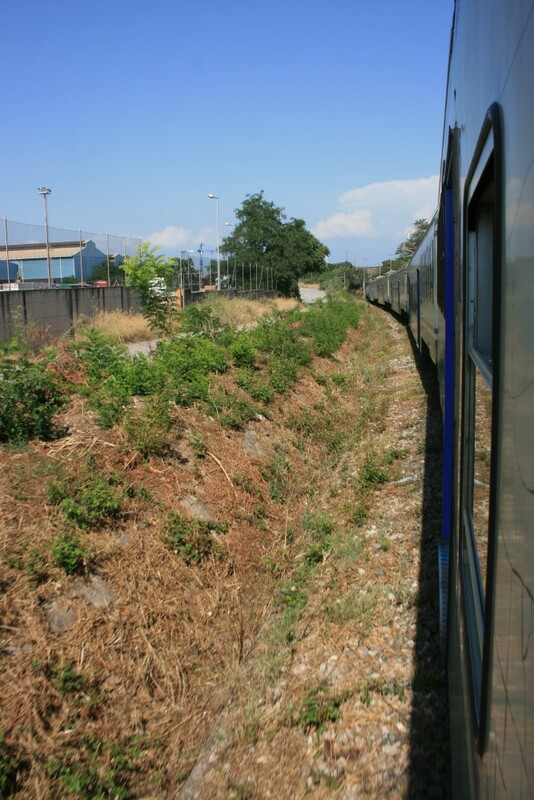 The driver is just changing ends, however, and soon we are away again, trundling through the unkempt, weed-strewn branch that leads to Piombino Marittima. 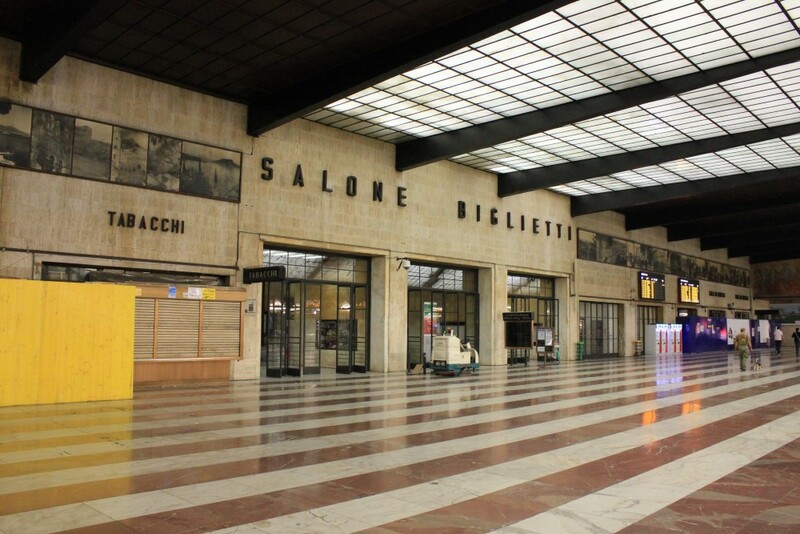 Whereas Piombino’s town station has the faded glory look of a village station which probably once had a proud station master, porter, dedicated signalman and a variety of ticket clerks, the port station is an altogether more modern, personnel-free affair. 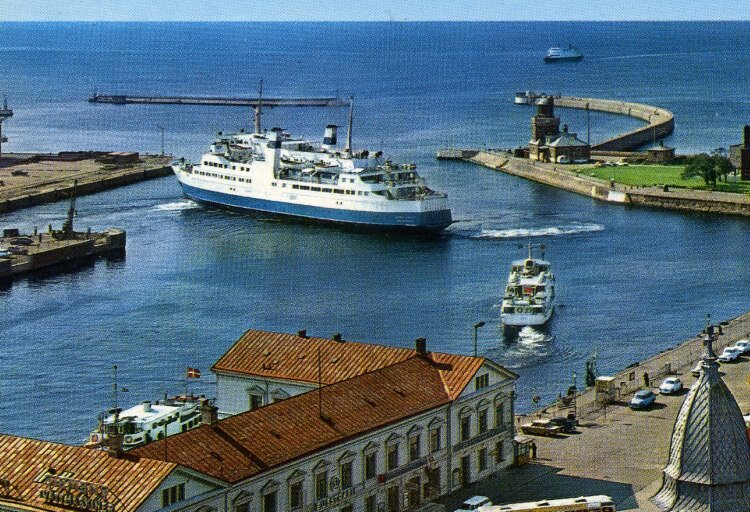 It was constructed in 1991 to replace the quayside tracks after an unfortunate incident in which a train rolled off the quay and into the sea. 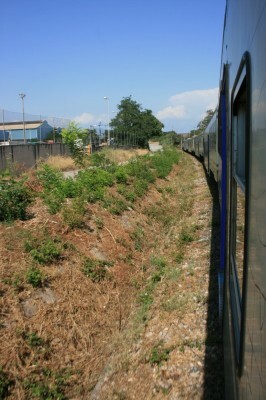 Down to the port - a branch line off a branch line. 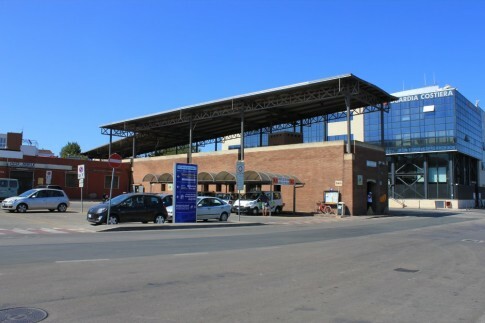 The ferry terminal at Piombino stands parallel to the station, overlooking the car loading lanes. 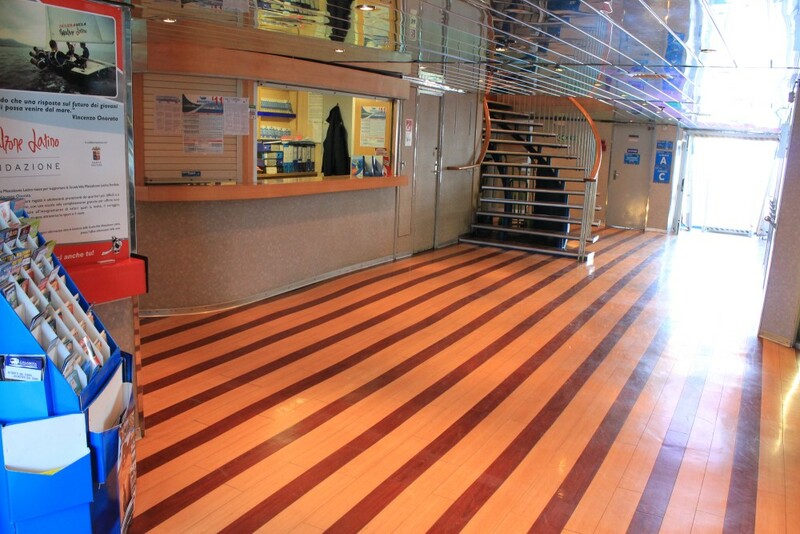 Inside, Moby and TOREMAR ticket desks glower at each other in a pretence of rivalry (they are now under common ownership). 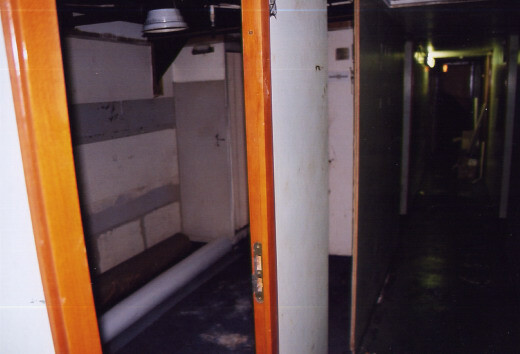 Tucked into a corner, the one ship service of Blu Navy try gamely to compete with their succession of poorly-chosen one ships. 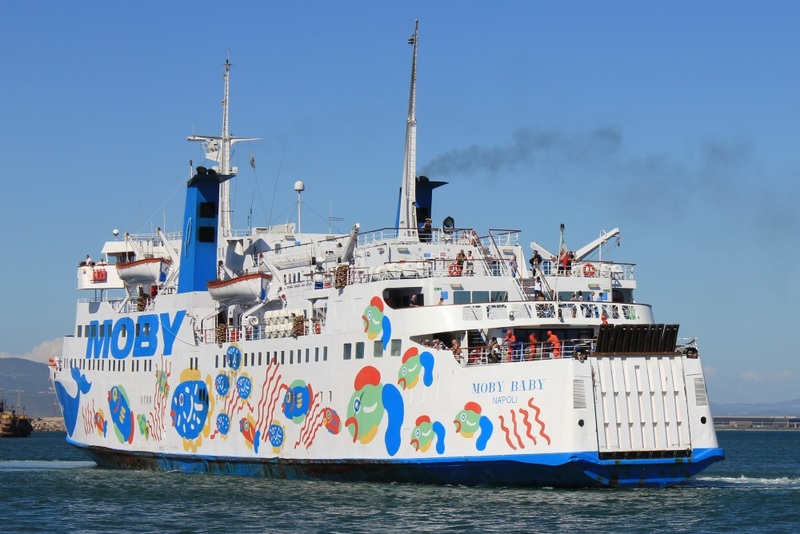 Most people just choose Moby, a carefully-crafted public image and buckets of bright paint more than compensating for a terrifically aged local fleet. 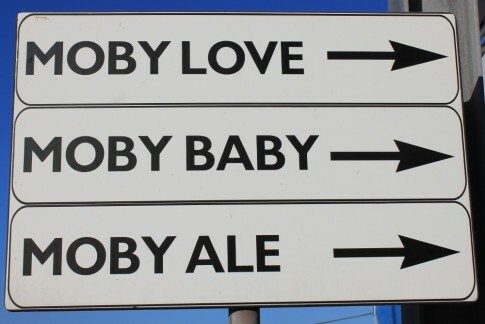 For this crossing we have the thrill of sailing on the oldest of them all, the Moby Baby. 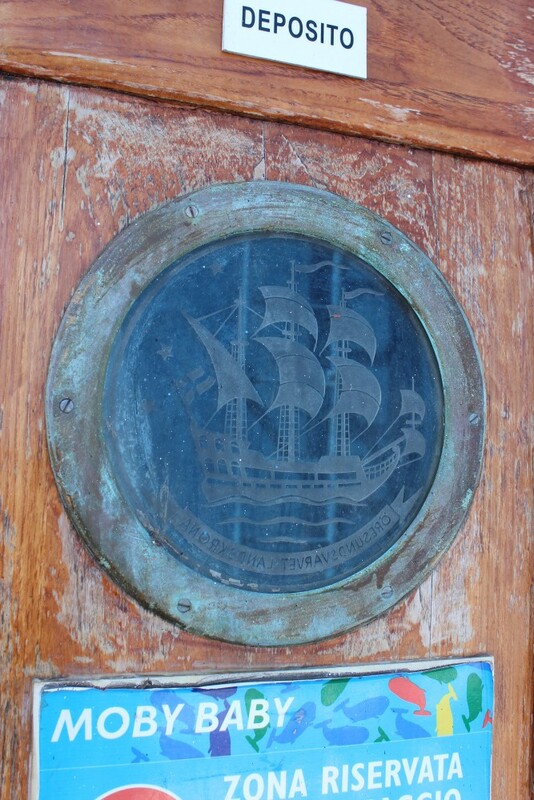 Her name is deceptive – completed in 1966 there is a fair chance she will last until her half century. 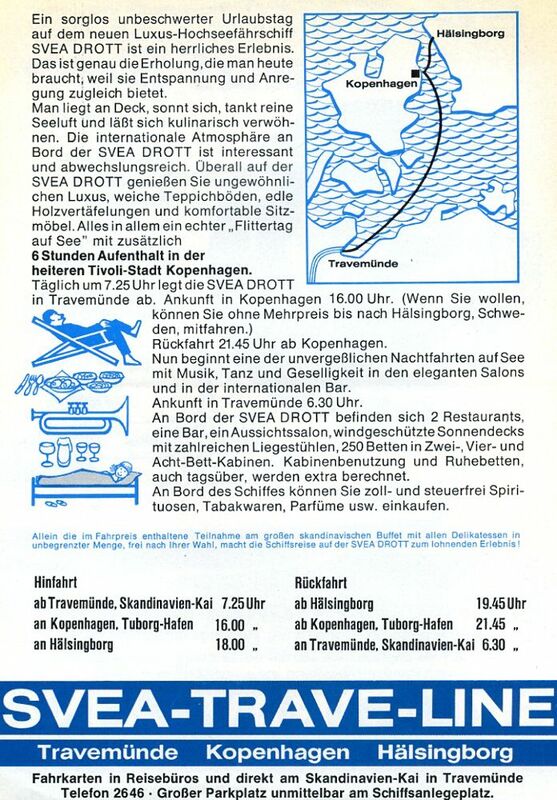 Built for Rederi AB Svea as the Svea Drott, she sailed under the Trave Line name between Helsingborg, Copenhagen (Tuborg) and TravemÃ¼nde. 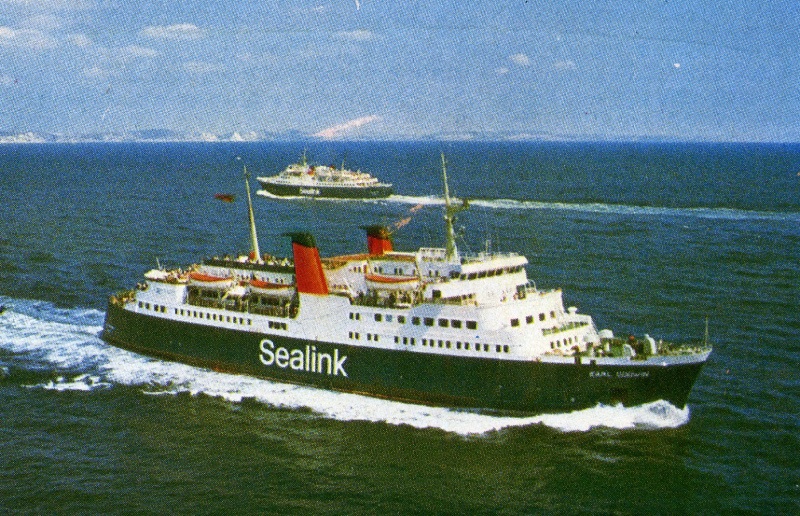 Derived from the design of the Thoresen Vikings, she proved a great success and was replaced in 1974, passing to Sealink for Channel Islands service, first on charter and later as the Earl Godwin. 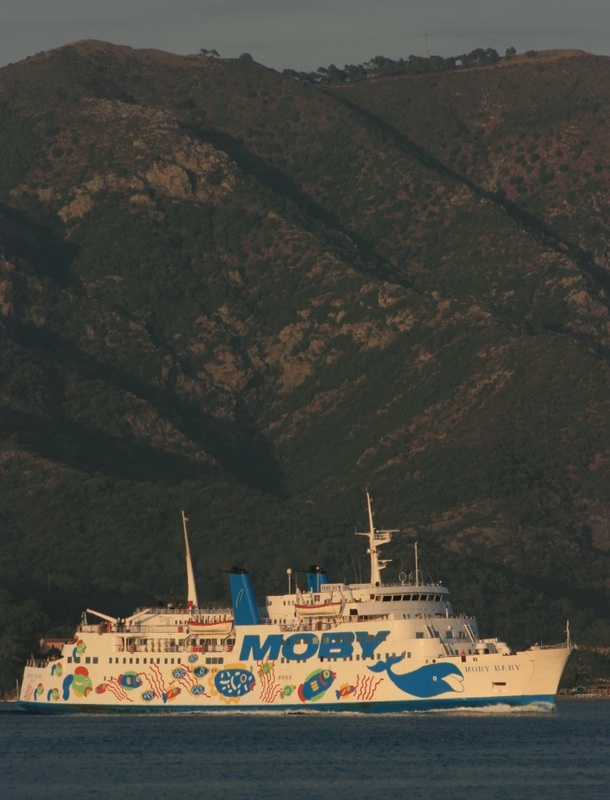 This lasted for 16 further years whereupon she was acquired by Moby for service to Elba – and there she has remained ever since. The Svea Drott arriving at Helsingborg early in her career. The Earl Godwin passing half sister Earl William (ex-Viking II) in the 1980s. 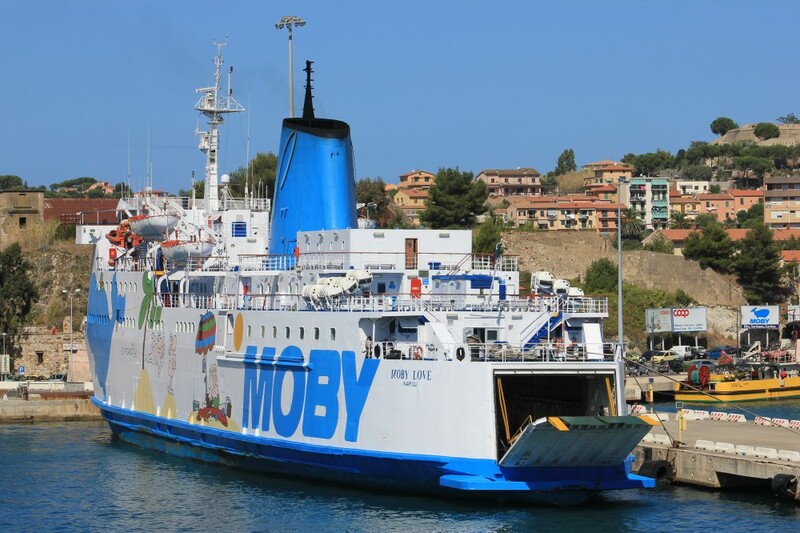 The Moby Baby approaching her berth at Piombino. 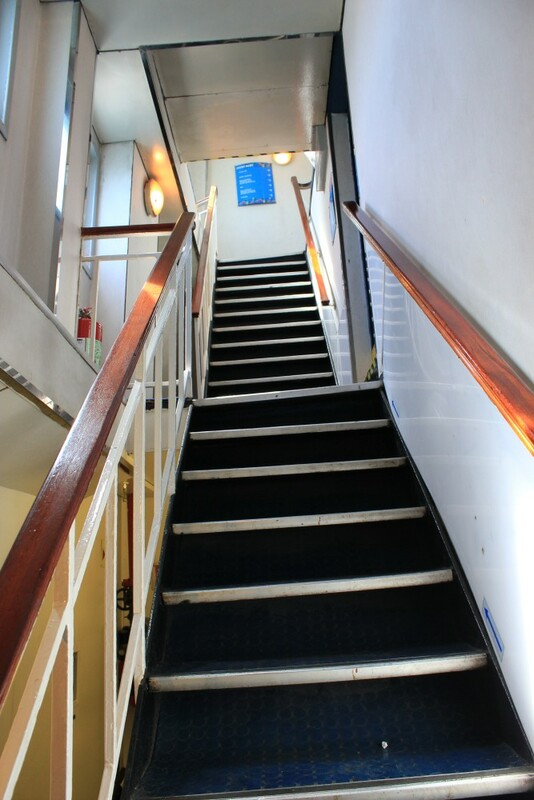 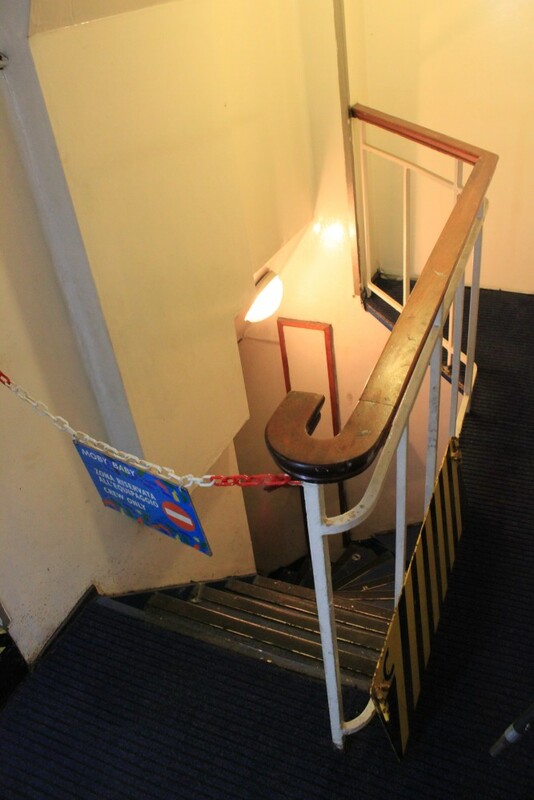 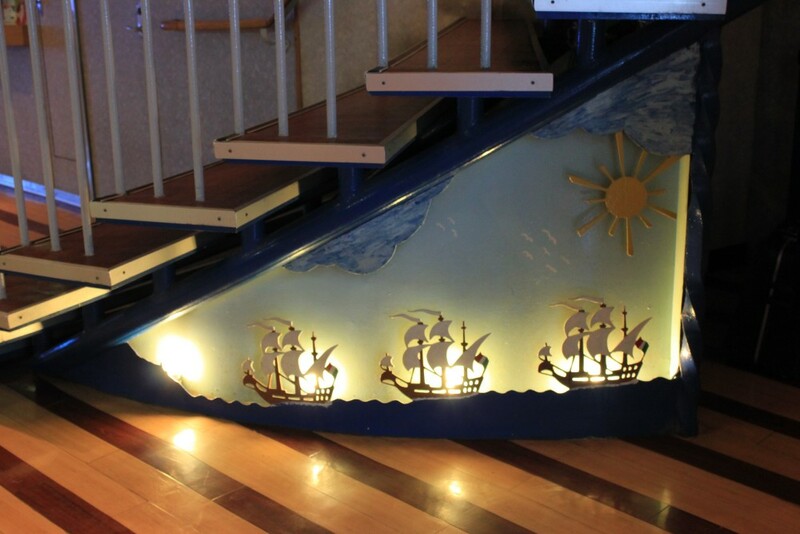 Foot passengers board over the pair of gangways to the left - each of the local ships fits one or other. 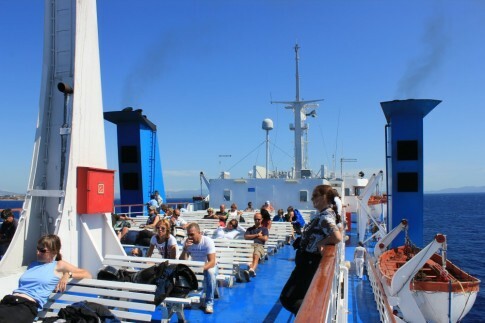 Arriving nearby is the little Bastia. 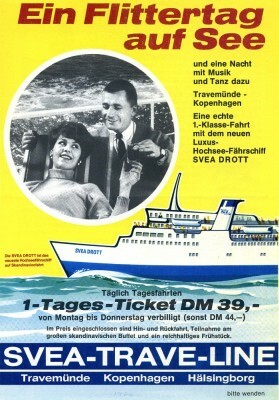 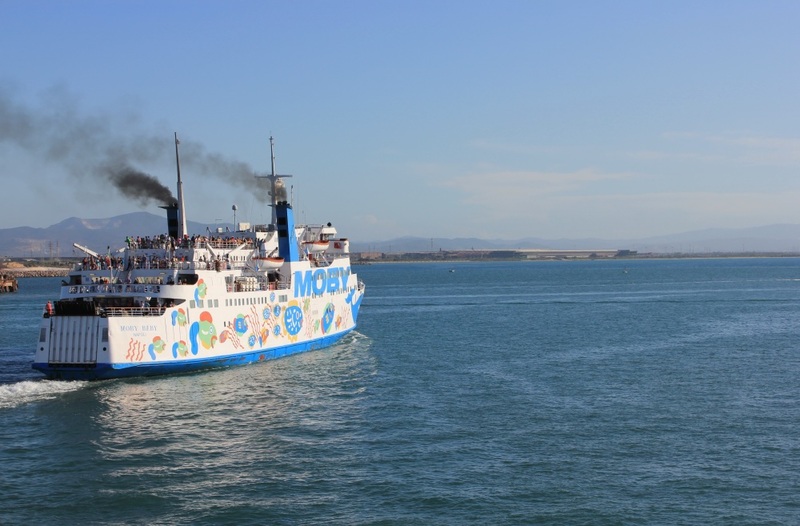 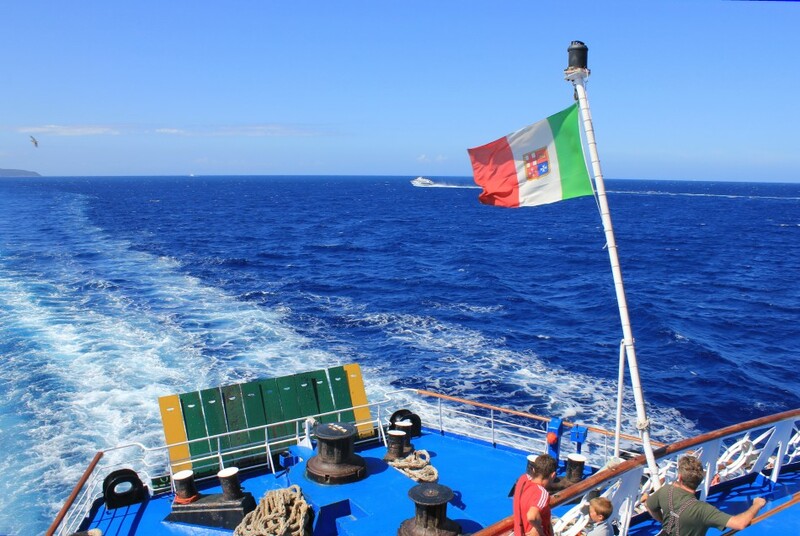 Delivered in 1974 she was Moby's first purpose-built ferry and is now dedicated to the 'low cost' Piombino-Cavo route. 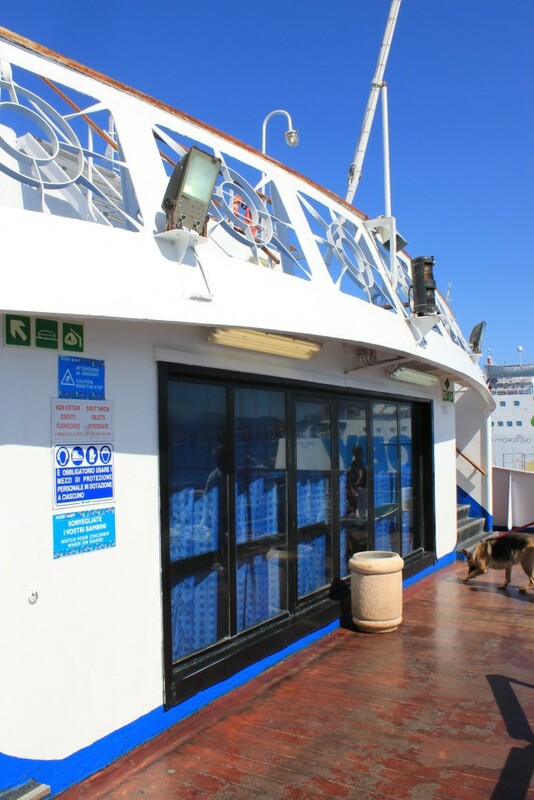 The rest of the company's Elban fleet sails solely to the main port of Portoferraio. 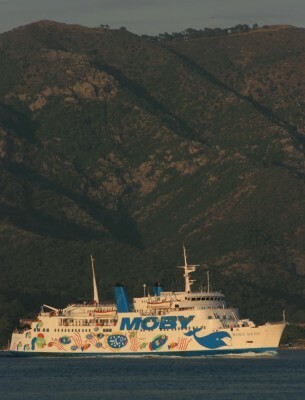 In the background is the Moby Aki. Moby’s peak season schedule provides for a departure every hour from either end; for some time now the ships providing this service alongside the ‘Baby’ have been the Moby Ale (ex-Mikkel Mols), Moby Lally (ex-Kalle II) and Moby Love (ex-Saint Eloi) with the Bastia and/or Giraglia in support. The crossing takes one hour, which provides just enough time to avail oneself of a slice of overpriced pizza, quickly explore the ship and watch the passing scenery. 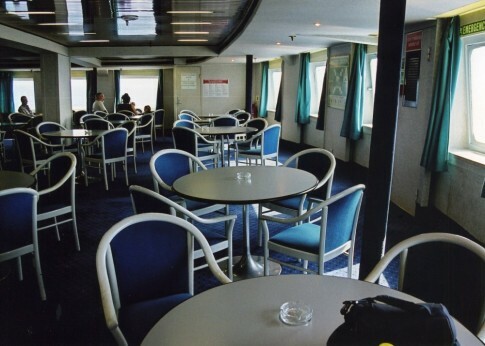 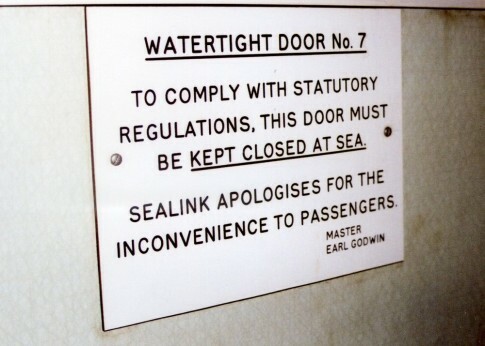 Although never truly an overnight ferry as such, the Moby Baby was certainly designed for longer crossings than this and the cabins beneath the vehicle deck, as well as the restaurant on the upper passenger deck, have been effectively abandoned; the tea bar forward of the restaurant also sees very limited use. 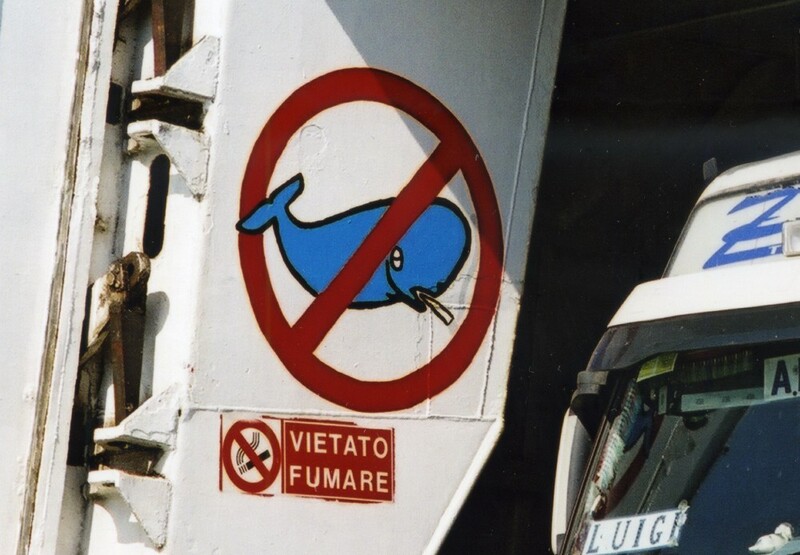 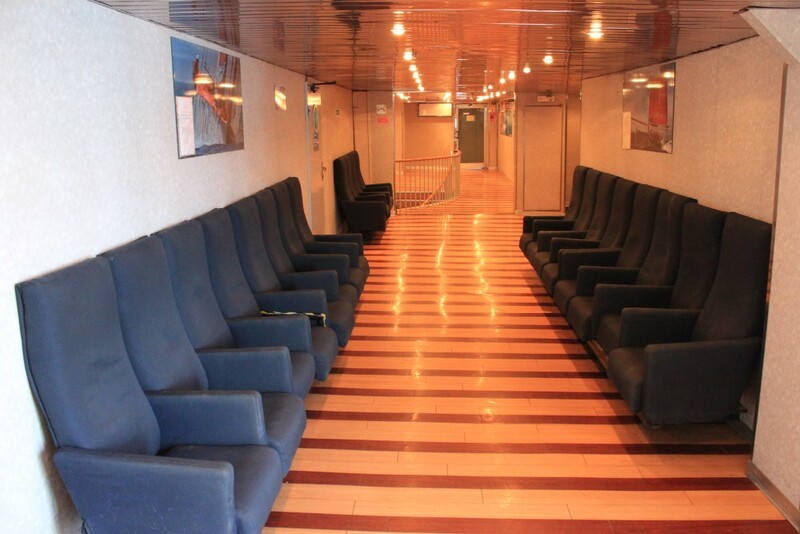 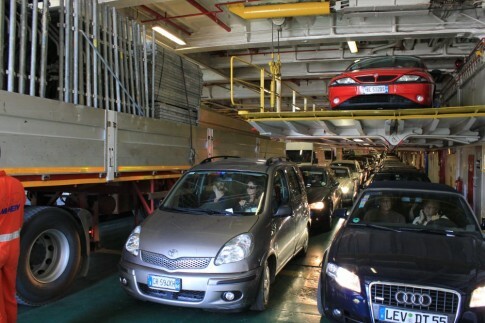 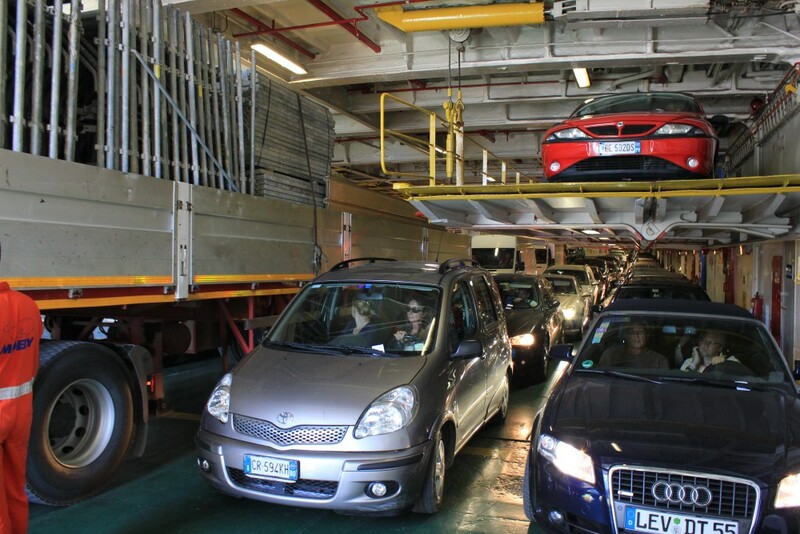 The scene is similar on the other ships – although they can all get very busy, passengers tend to head out on deck and hence, even with large saloon areas closed, the ships can generally cope with the loads. 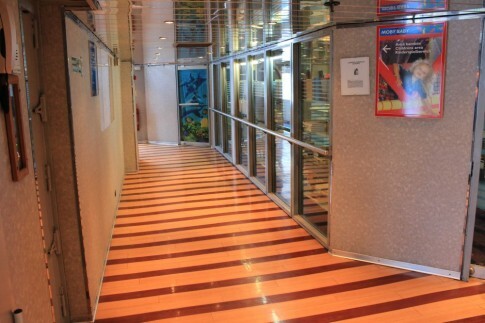 Passengers coming aboard the Moby Baby enter into the lobby, amidships on the main passenger deck. Beneath the lobby staircase is an arresting detail - for the sailing ships are three versions of the logo of the Svea Drott's builders, the Ã–resundsvarvet in Landskrona, the Swedish flag at the stern now painted as the Tricolore Italiano. This emblem still forms the logo of the current Oresund Heavy Industries. Forward is a classic Sealink seating lounge. 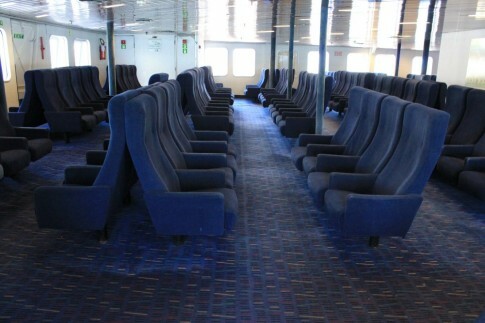 ... and a further large open-plan lounge. 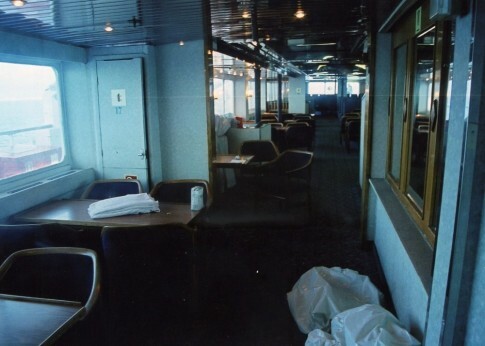 A locked and abandoned seating lounge, just aft of the former restaurant. 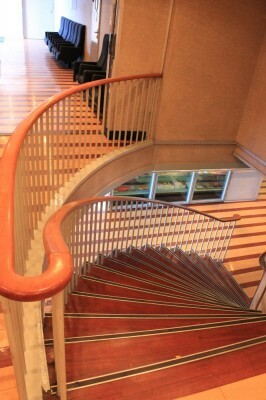 Forward of the restaurant entrance is this upper lobby, with the stairs leading down to reception and the closed doors to the forward saloon in the distance. 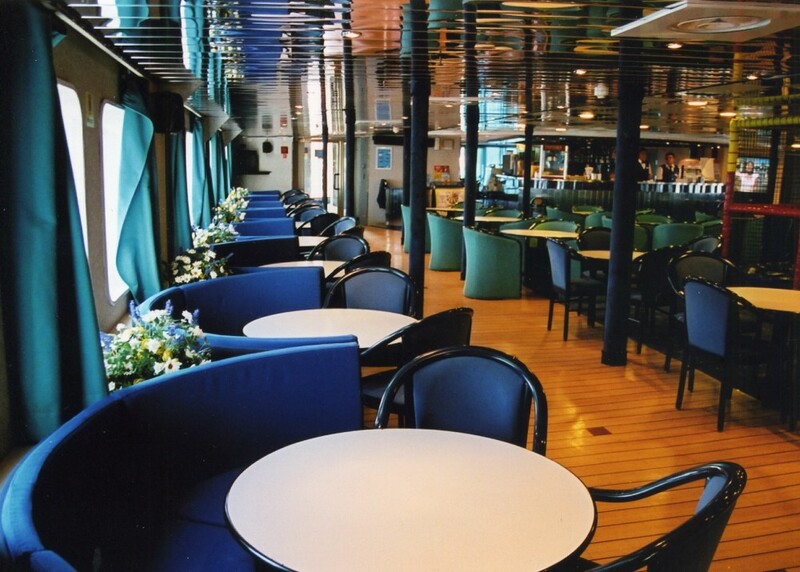 The forward lounge seen on one of the rare occasions it is open; with its view ahead it is probably the most pleasant saloon aboard. 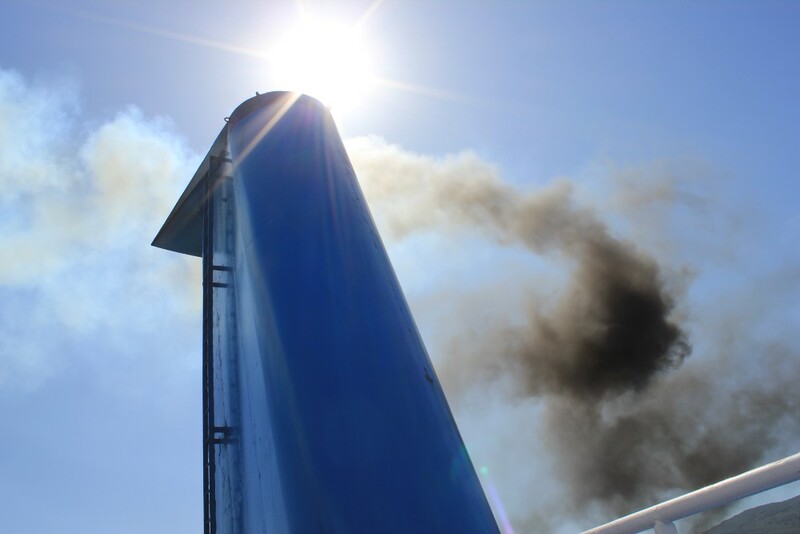 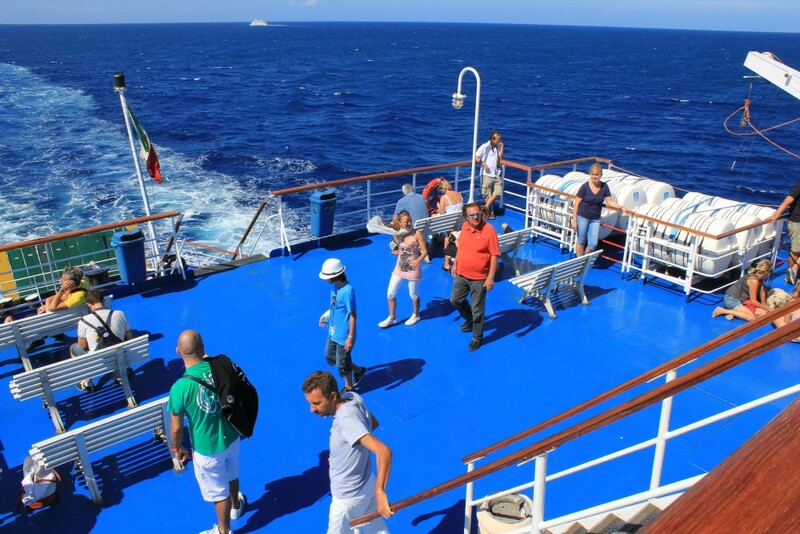 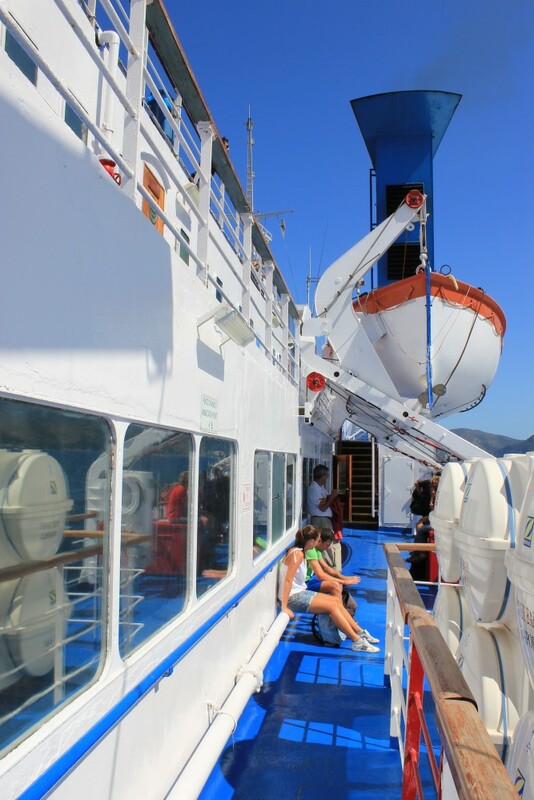 Most passengers find a sunny spot on the outside decks. 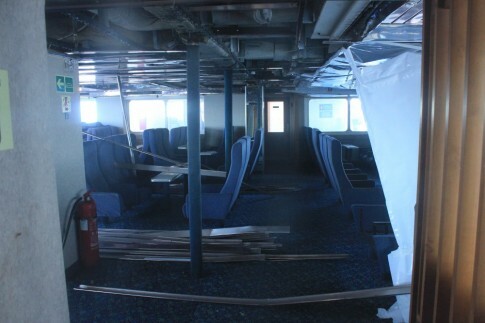 Look carefully at some of the portholes on the upper decks and it can be seen that they too bear the ship logo as well as the name of the Ã–resundsvarvet, Landskrona. 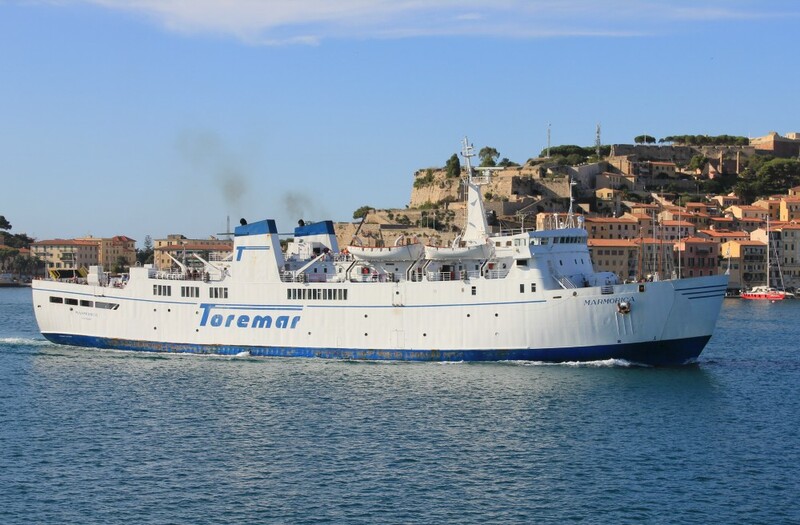 As we approach Portoferraio, the Marmorica of TOREMAR makes her departure. 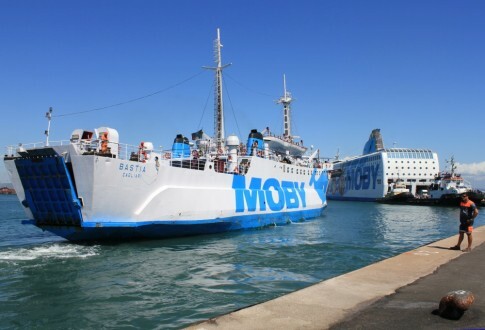 In port, the Moby Love is to be found laying over between sailings. 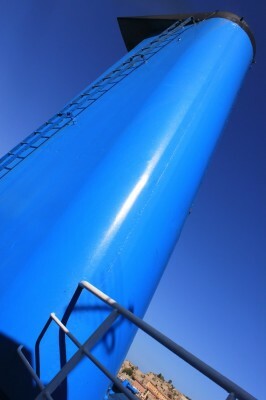 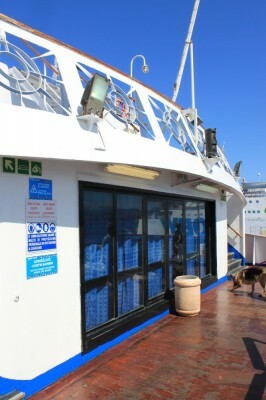 Disembarkation for foot passengers can be via the gangways, as at Piombino. Those more impatient however can make their exit via the vehicle deck. 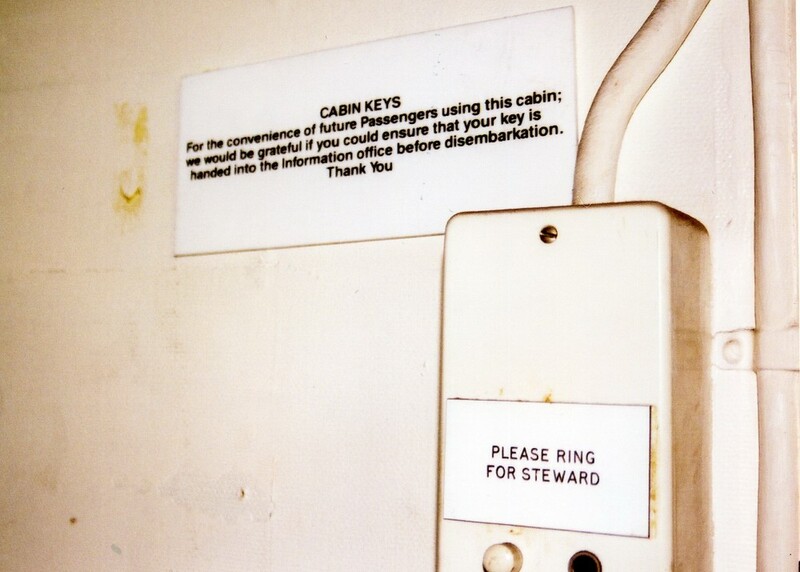 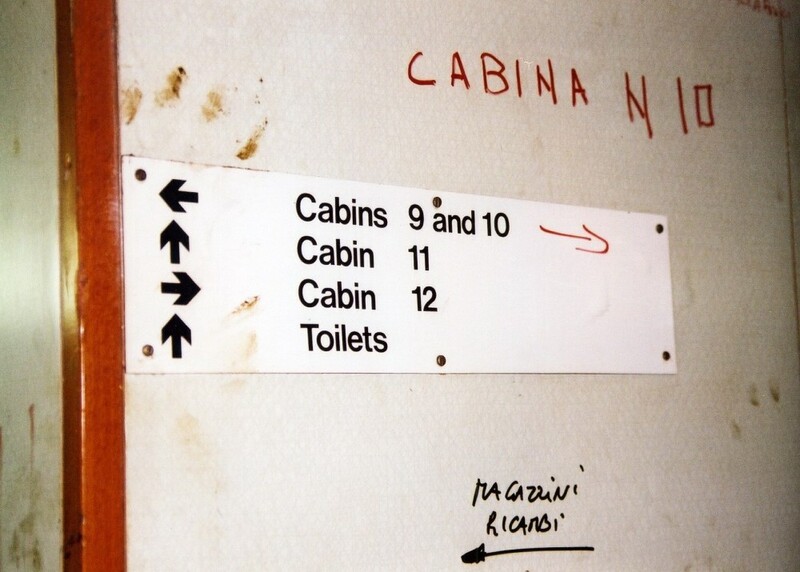 Before we get off, there is just time for a peak at the former cabin area, downstairs on Deck 2. 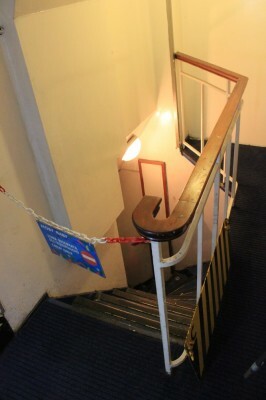 Down here things are largely derelict. 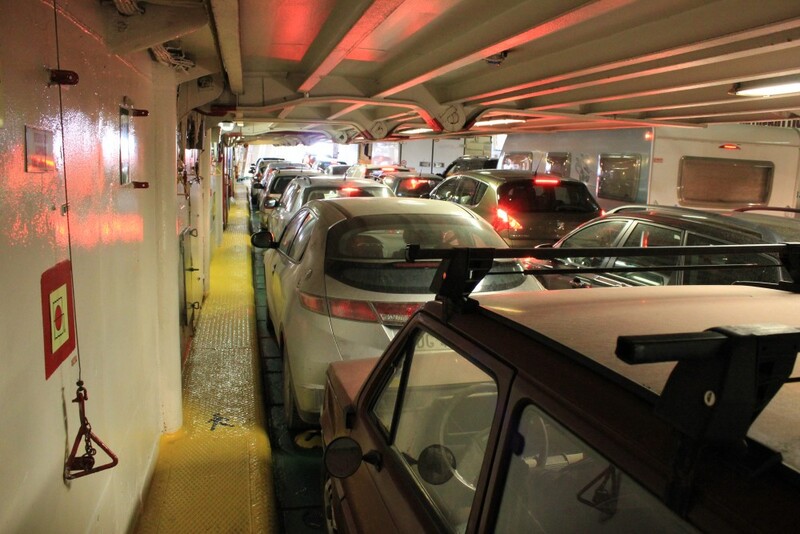 Back upstairs to exit via the crowded car deck. The Moby Baby is a fun little ship to cross in, although she offers few diversions other than the pleasure of being at sea. 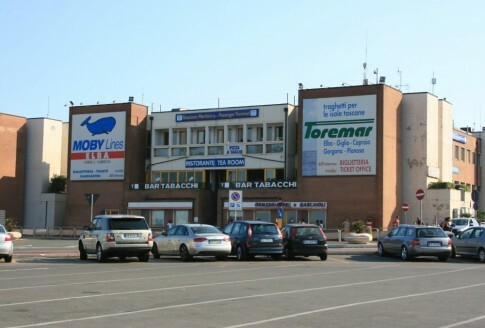 The acquisition of TOREMAR and the wider group’s involvement in Tirrenia may mean that investment in replacements for Moby’s own brand fleet might be lacking in the next few years. And so, mechanical failures aside, the Moby Baby and her aged fleetmates will have to sail on as part of the sea connection in the Elba Arrow for some time yet. 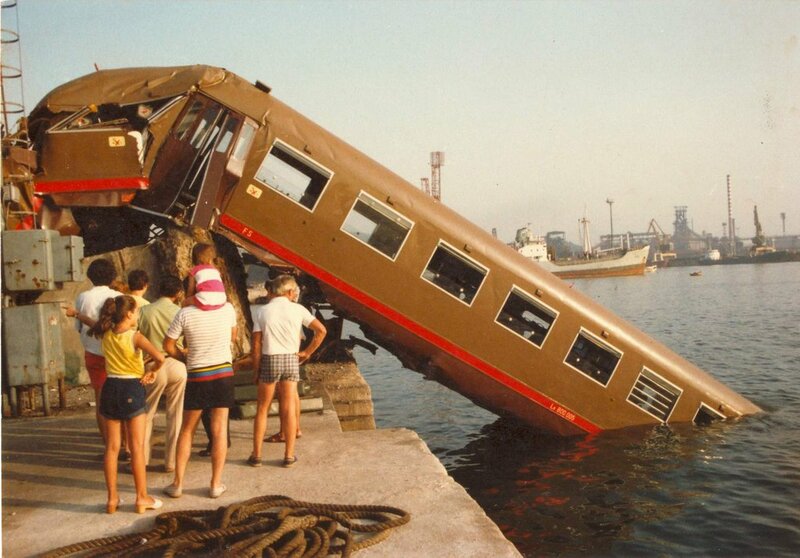 Recent cuts to the schedules of FS, the Italian state railways, have been quite savage in certain areas; mercifully the Piombino branch line has been preserved, enabling passengers to continue to take the boat train, just as one could to Weymouth in the Earl Godwin’s Sealink heyday. 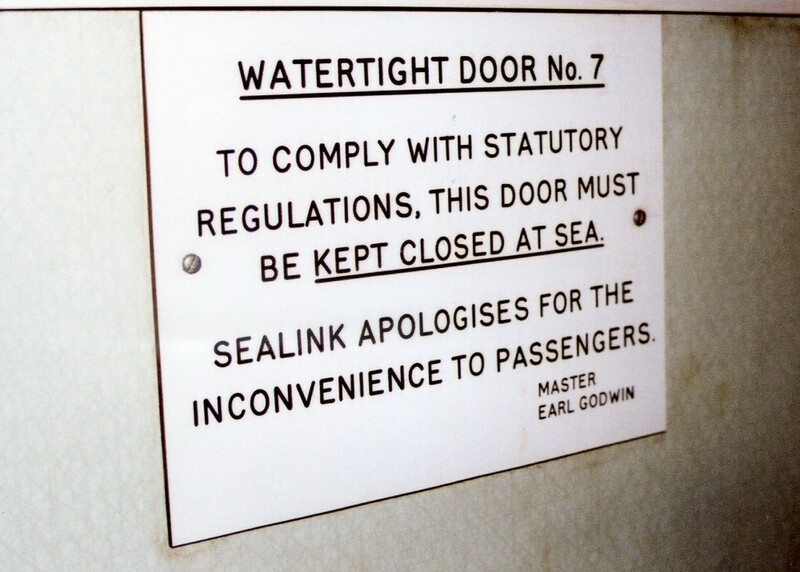 Good to see the former Earl Godwin is still a working ship, my father was chief engineer on her sister ship Earl William and I also sailed quite a few times on the Godwin. Nice report and pics. Lovely pictures of lovely ships, in lovely weather – thanks. 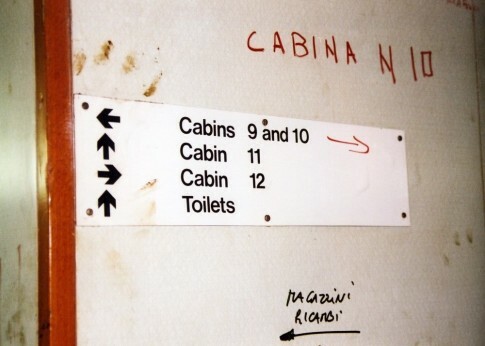 Reading this post brings back so many memories. I used to travel on the Godwin between Weymouth and Guernsey as a child in the late 70’s and early 80’s. It’s vey odd seeing the lounge pictures thinking I spent hours there as a child. For some reason I always liked the Godwin over the William, but can’t remember why!